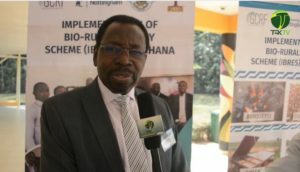 Nottingham University in collaboration with the Global Challenges Research Fund, Centre for Energy, Environment, and Sustainable Development (CEESD) and KNUST have organised an Impact Acceleration Workshop dubbed Implementation of Bio-Rural Energy Scheme (IBRES) Ghana. The workshop chaired by Prof. Mark Adom-Asamoah, Provost for the College of Engineering KNUST played host to the Principal Investigator of the IBRES project, Prof. Jo Darkwah and Dr. Alison Mohr, co-investigator from the University of Nottingham in UK in which they took turns to give extensive presentations on Environmental impact of Cocoa Pod Husks (CPH), particularly the energy generated from cocoa husks. According to Prof. Jo Darkwah, the research is part of a 0.7% United Kingdom budget allocation of GDP for the reduction of poverty, provision of energy and healthcare in remote places of developing countries. According to him, the UK government has partnered with several universities and NGO’s in spearheading the pilot implementation of the scheme in Ghana. Explaining the concept to attendees at the workshop, he said feasibility studies were organised in 2017 in areas of cocoa production, collated data was put into a comprehensive database to establish the type of cocoa husks which had energy capabilities. He explained the theoretical processes were all part of the data gathering processes as soil samples were sent back to the UK for further testing and evaluation. He said the scheme was also an integrated approach for the generation of Biomas and modification of different forms of technology to train farmers as well as creating awareness to draw attention to waste and be part of the development energy scheme development in setting up of successful small scale business ventures. The workshop attended by key players and stakeholders in agriculture and technology, including Chief Director at the Ministry of Environment, Dr. Julius Ahiekpor (a partner of IBRES) discussed the use of cocoa pod husk as a sustainable energy source in rural off-grid, The technology transfer of equipping local artisans on fabricating equipment for alternative use of CPH by Mr. Michael Komeh and Prof. Kofi Ampomah-Benefo, a research scientist with the Centre for Scientific and Industrial Research (CSIR) believes the technology being introduced will need additional or extra funding to make the scheme a reality for farmers in rural areas. He says if the initial processes are able to meet the needs of the people, it can be practical. The professor believes half of funding for researches are donor funded, in which profits are expected, as such the core mandate for the research may not be met. He says it’s the Government’s responsibility to help practicalize the initiative and give adequate funding to its execution.